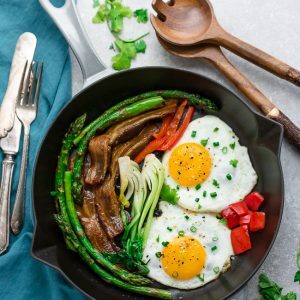 Keto Sunny-Side Up Eggs and Bacon – a classic breakfast staple with tips to make perfectly fried eggs and the best crispy oven baked bacon. 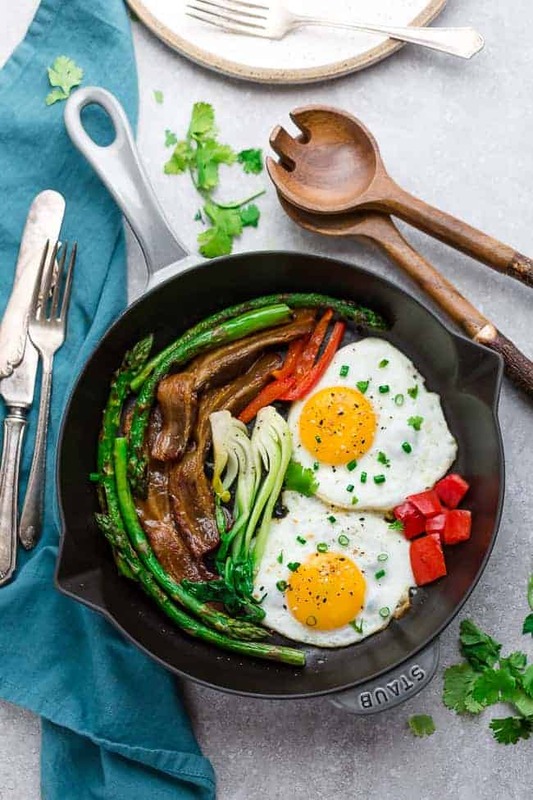 Served with sauteed asparagus, bok choy and red bell peppers and perfect for breakfast or weekend brunch. Eggs for breakfast is a favorite around here. You can’t beat how easy they are plus, they’re full of nutrients, protein, low carb, paleo and keto-friendly. We usually warm up one of these mini Breakfast Egg Muffins that we meal-prepped over the weekend since they make the busy mornings so much easier. And then on the weekends or for a special occasion (hello Father’s Day ?) we like to switch things up. This recipe for keto sunny-side up eggs and bacon is a classic favorite. 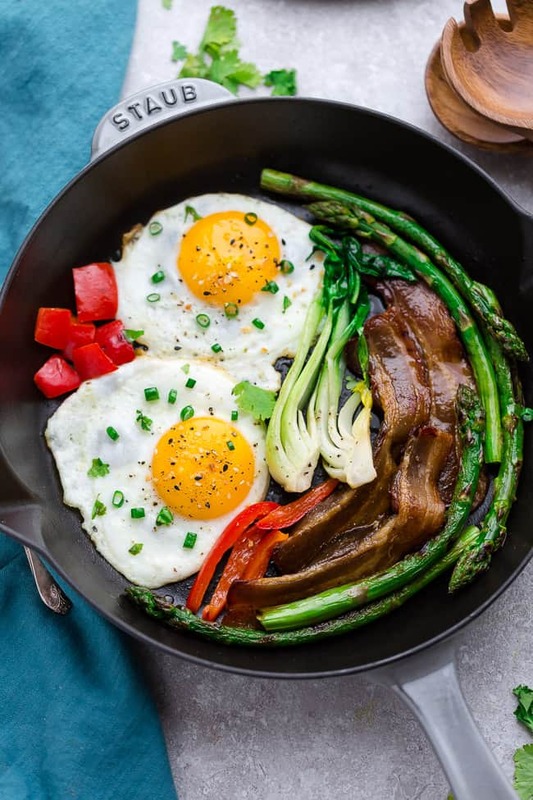 Bacon and Eggs is a staple breakfast, especially for those on a paleo, low carb or keto diet. And for a whole 30 compliant breakfast, be sure to use a sugar free bacon with no additives or nitrates. With golden yolks and tender, just-set whites, classic sunny-side up eggs are the best with a side of perfectly cooked crispy bacon on your breakfast plate. So how do you make them just right? Here’s how to nail classic fried eggs every time. Start off by heating a large non-stick frying pan over medium-low heat. You want the pan large enough to hold 2 eggs at a time with a bit of space between them. You can test the temperature by pouring about 1/2 teaspoon of water into the heated pan. If water sizzles and evaporates on the pan, it means that pan is hot enough to hold the eggs in the right form. Coat and tilt the bottom of the pan with 1 tablespoon olive oil or butter (allow it to melt first). You don’t need a large amount of fat to fry the eggs because the pan is non-stick and you don’t want the eggs to turn out greasy. Gently crack the eggs into the pan to avoid breaking the yolks. You can also use an egg ring to keep the eggs round and yolks centered. As the eggs cook, their color will change from clear to opaque white. Cook until the tops of the whites are set but the yolk is still runny. This will take about 2 to 2-1/2 minutes. If the oil starts to splatter, turn the heat down slightly. Remove the pan from the heat. Use a large, metal spatula (not rubber) to remove the eggs from the pan one at a time and place on a serving plate. Sprinkle with salt, pepper and any other seasonings you like. Line a large baking sheet with aluminum foil (easier cleanup) and then a layer of parchment paper on top of the foil. Lay the bacon on the baking sheet in a single layer. The bacon can be close together, but don’t let it overlap or the bacon will stick during cooking. Bake the bacon. Bake until the bacon is deep golden-brown and crispy, 15 to 20 minutes. The baking time can vary and depends on the thickness of the bacon and how crispy you like it. Rotate the tray at about 10 minutes and start monitoring to see how quickly the bacon cooks. Line a plate with paper towels then transfer the cooked bacon to the plate. Use tongs to transfer the crispy bacon to a plate lined with paper towels to drain and finish crisping. Serve immediately. 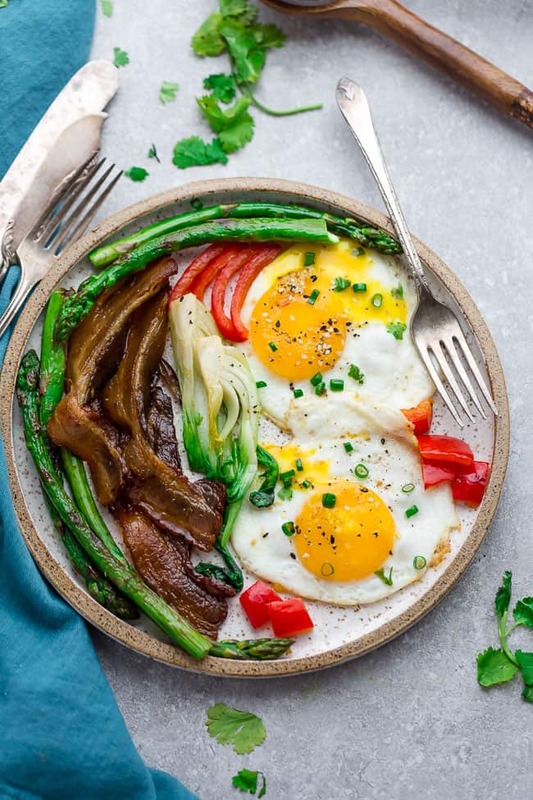 Keto Sunny-Side Up Eggs and Bacon - a classic breakfast staple with tips to make perfectly fried eggs and the best crispy oven baked bacon. 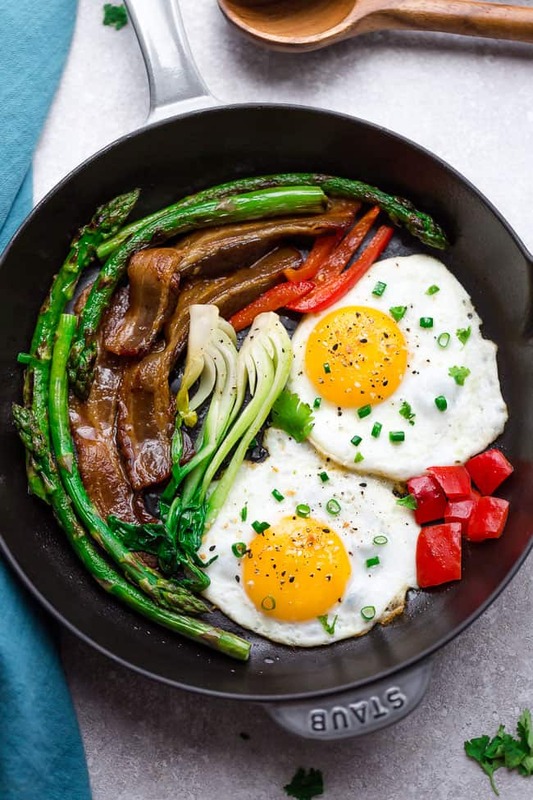 Served with sauteed asparagus, bok choy and red bell peppers and perfect for breakfast or weekend brunch. Fry bacon in a frying pan over medium heat until crisp, or alternatively cook in the oven. Preheat oven to 400˚F. Line a sheet pan with foil (for easier cleanup) then a sheet of parchment paper on top. Lay the bacon in a single layer (making sure to not to overlap) on the pan. Bake for 15-20 minutes (rotating try once), or until crisp. Heat oil in a large frying pan over medium heat. Add oil then garlic and cook, stirring, until fragrant, about 30 seconds. Add the asparagus, bok choy, bell peppers and 1/4 teaspoon salt and some pepper and cook, stirring, until the asparagus and bok choy are bright green and crisp-tender, 4 to 6 minutes. Wipe down the same frying pan and heat remaining oil over medium low heat. (To test the temperature - add 1/2 teaspoon water - if the water sizzles and evaporates then pan is hot enough). Swirl and tilt pan to coat the bottom then gently crack 2 eggs into the pan. Let cook until white has set, but yolk is still a bit runny, about 2-2 1/2 minutes. Carefully remove from pan with a spatula. Season with salt and pepper. Repeat with the remaining eggs.